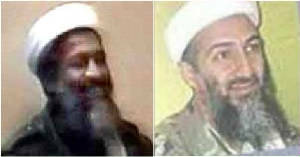 Do you have any difficulty distinguishing which is REALLY Osama bin Laden? Can you be mislead into thinking, believing the man on the left is Osama? A lot of celebrity newsmen and politicians have tried. Picture 1 above was taken on 24 December 1998 by the AP photographer Rahimullah Yousafzai during a conversation with a group of reporters in Afghanistan. Picture 2 is a detail from the video tape published by the Pentagon and sent around the world on 13 December 2001 in order to prove the guilt of Ben Laden and to construct a retrospective legitimation of the war. It is part of a take where the inserted text contains an alleged statement of Ben Laden saying, that the time difference between the first and the second plane hitting the towers was twenty minutes. The above article indicates that the videotape wasn't handed to the anti-Taliban forces, they physically located it. Don't you find it somewhat fortuitous that anti-Taliban forces just happened to stumble across a very small videotape of Osama confessing to the 9/11 attacks in this very big city? To be perfectly honest it is preposterous to think the videotape is authentic, but lets have a look anyway. Here's 5 Osama's - which is the odd one out? Even Mr Magoo would have to say that Osama 'E' stands out like a sore thumb, and this is the man on the "confession" tape. Between the nose and the cheeks it is clear that this man is NOT Osama. It does not get any more obvious than this. There is clearly good reason to doubt the tape. There is excessive noise on the audio track, making it impossible to really hear what is being said. Given that the tape was recorded in an area supposedly devoid of audio urban signature, there should have been little ambient noise, yet the speech is masked with a great deal of noise. Then there is that gap in the audio track, reminiscent of Nixon's missing 18 minutes, and the truths it once contained which are lost forever to history. Doubts have already been raised regarding the correct translation of the speaker's words into "We", when his words could also mean "They". But there are very good reasons to suspect that the tape is not what the US Government claims it to be. In the tape, Osama supposedly states that he knew of the attack on the WTC 5 days in advance, yet we know from the preparations inside the United States that the plan had been in existence for much longer than that. The records of those flight schools where the hijackers supposedly trained have been confiscated under the watchful eye of Jeb Bush, Governor of Florida and brother to the President. Will the Bush administration now claim that the hijackers learned to fly a passenger jet in just 5 days? Likewise, The translation of the Osama tape has him stating that the hijackers did not know they were about to die, yet the letters the FBI claims to have found written by the hijackers indicate the exact opposite. Then too there were the numerous words added to the translation in parenthesis to alter and redirect the meaning of the translated words. Finally, this was not the first video tape claiming to be evidence against Osama to surface, and the public is well aware that the claims made regarding the earlier "confession" tape, including a claim that Osama had nukes, were created by the translator, not actually stated by Osama. Even hard line secular Pakistanis are unconvinced. Iqbal Haider, a former senator from the party of ousted prime minister Benazir Bhutto, said he found it hard to believe that bin Laden would allow himself to be filmed confessing to the crime. "It is hard to believe that a man who masterminds the September attacks which such secrecy and finesse could be that stupid and imprudent," he said. "I hate Osama and the Taliban because they inflicted incalculable damage on Muslims ... but it is hard to digest that he can be such a fool." The figure claimed to be Osama appears to write notes with his right hand, yet the FBI's description of Osama indicates he is left-handed. 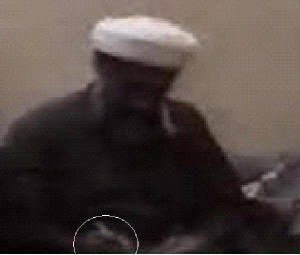 The man in the video wears a ring which does not appear on other confirmed photos of Osama. It was a poorly quality video, smudgy, but the character actor who played Osama was obviously a very poor choice by Central Casting. His face is round instead of the characteristic long, sallow look of the REAL Osama. Short nose, broad, round cheeks, and small eyes make this a poor caricature of the leader of "al Qaeda," so named by Richard Clark in 1998. The Real bin Laden is LEFT handed. A Pakistani argues that the bin Laden video is fake, because it shows "Osama gesticulating excessively with his right hand. People know that Osama speaks in a cold, deliberate, slow manner and is left-handed." Many have fallen for this most blatant attempt to confuse the world. There is no need to understand Newtonian physics to understand that the WTC could not fall in 10 seconds. You won't have to understand the nuances of "pulling the building," and demolishing building 7 for no declared reason. You won't have to search for the plane at the Pentagon, or watch George reading My Pet Goat with the children while the USA is allegedly being attacked. You won't have to aimlessly wonder why the Secret Service didn't grab him and speed out of his exposed location 5 minutes from a busy international airport. Don't bother trying to figure out why there were no military interceptors to even try to intercept "hijacked" "commercial passenger aircraft" headed toward the Pentagon. You won't have to dig any longer to determine if the Official Conspiracy Theory is true. You have the evidence right before your eyes. They induced a lot of people to see what wasn't there. Beyond the body types, the real Osama has large eyes without trying and Howard the Hit Man's would have to work at getting his eyes open that far. Osama has arched eyebrows at rest and Howard the Hit Man has almost straight eyebrows. The hair on the side of Howard's face indicates that it is wide. At any rate, overall there are so many differences only a people dumbed down with Saturday cartoon "plausible impossible" syndrome cannot see the difference. The bogus tape is obvious! The person on the tape is deferent than USAma Ben Ladeen”, look at the nose, the cheeks and the mouth. With all the superiority in movie making, why they made a tape so obviously fake? 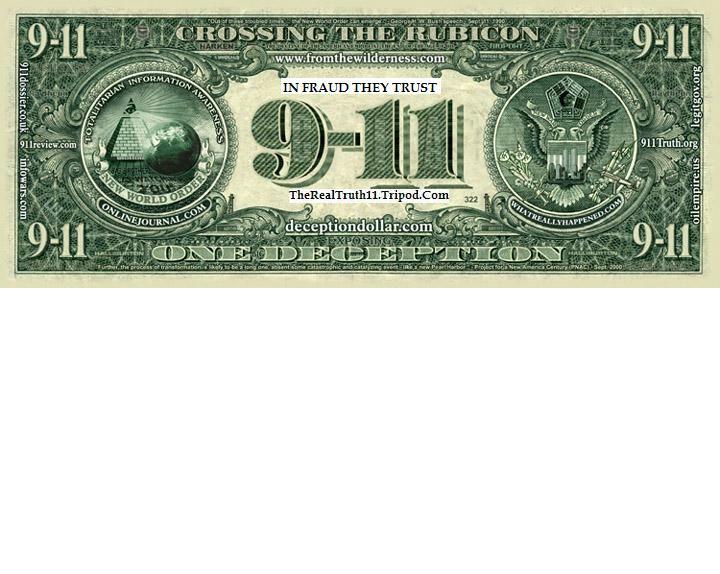 Knowing that the tape was fake, and intentionally made to divert attention from the real terrorists behind 9/11 attacks, in sight of that, why the real Ben Laden” didn’t come out and say that he is not the one in that fake tape? The answer to that is one possibility! Because he is working with them! But they still need him to do more for them! So, they produced a tape that he can easily dispute among his deceived comrades. Americans and the world believed it! Because they want to believe it! They were conditioned to believe it! They were brain washed to believe it! Think about that. Why did the CIA sponsored TV station Al-Jazeera promoting this fake tape, and every tape of Ben La Deen, and his partner Azwaheri as if those tapes ware real, and as if those terrorists ware real. Add to that the bogus Zarqawi, the Blue man as his name literally translates. So knowing that a Zarqawi is a CIA agent, why they killed the leader of the Saudi Inelegance and the leader of the Palestinian authority intelligence, in a 3 simultaneous attacks at the large hotels in Jordan? At the time when the Bush administration is being investigated for spaying of American citizens, is it to cover up other props, where American citizens were conspired on, using foreign governments’ intelligence. What were they cooking together? Before they decided to cover it up by assassination. Back in 2002, the Bush administration was chagrined when the world's foremost voice identification experts, a group in Swizterland called IDIAP analyzed several Bin Laden tapes and concluded that a "CIA-verified" bin Laden tape was NOT Bin Laden, but someone whose voice patterns resembled the terrorist's. Now again we have a Bin Laden tape that arrives just when Bush needs a "terrorist diversion." And once again, we have only the CIA "experts" verifying the authenticity. So why since 2002 hasn't the IDIAP been called in to verify these, always conveniently timed tapes? And why is no CIA expert ever actually named? And as further evidence of how closely the US media is colluding with Bush, journalists who once queried the institute for their opinion on the authenticity of bin Laden tapes are no longer doing so. Duke University Bin Laden expert Bruce Lawrence, who is the head of Duke's religious department, also thinks the tape was faked. …. "While the CIA confirms the voice on the tape is bin Laden's, Lawrence questions when it was recorded. He says the timing of its release could be to divert attention from last week's U.S. air strike in Pakistan. ……..